Rene De Keyzer to Lead XL Video in U.S.
XL Video has introduced the new CEO for their US operation, headquartered in Atlanta, GA.
At an event in New York on Monday evening, Rene De Keyzer, XL’s Founder/President was introduced as the new head of XL Video Inc. De Keyzer, who started the company around the 1996 Atlanta Games, has already taken the reins in the Atlanta office, and is relocating there with his family. The New York event was held in advance of the New York Auto Show this week, where XL Video will supply video solutions for a range of exhibits at the show. 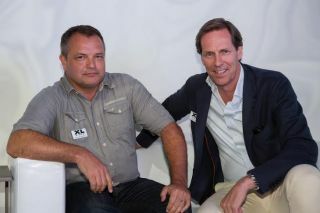 The event was also attended by XL Video’s global CEO, Lucas Covers, and group Chief Technology Officer, Kristof Soreyn. Attendees were also treated to demonstrations of some of XL Video’s latest solutions including products from XL’s major LED investment earlier this year. High-resolution LED products were shown, as well as the MC-18 Hybrid LED which integrates powerful LED spotlights with a lightweight 18mm LED screen. Lucas Covers comments: “The new LED solutions we have demonstrated at this event are just part of our multi-million dollar investment in new technology across the XL Video group.